Ever since I was blown away by Eataly's vegetable station, I've been wanting to further investigate what their other stations have to offer. We started with the Antipasto Misto ($13), which varies with what's seasonally available in Eataly's market. We couldn't help but order the Quadrati Ricotta e Spinaci ($17, pictured above); a homemade spinach ricotta ravioli with lemon butter and pistachios. Everything was fresh, high quality, and generally pleasing, but which corner of Eataly will I be returning to? Instead of attempting some grand and ridiculous quest to eat at all of Eataly's restaurants in one go, I decided to take it slow. I'm going to delve pretty deep into all the different options, but if you just want to skip all of that and jump to my favorite places to eat, here you go. Each of the upstairs restaurants has its own tables, though some, like Focaccia and Rotisserie, are just high-tops without seats. Let's just jump right to what is, without a doubt, the most popular restaurant area at Eataly. I realize some completely disagree with my assessment, and perhaps I just got a few lucky batches. When I got ready to order at La Pasta, my waitress inquired whether I was aware of the concept of al dente pasta. In fact, 14 oz Piedmontese Boneless Ribeye ($42) is one of the very best steaks I've eaten in Chicago, and I've recently eaten a lot of steak. Considering it has great beer and fantastic snacks, I guess it's no surprise that Birreria gets very packed, especially at night and on the weekends. This is hard to explain, but I love how straightforward and unencumbered every dish is here. Sometimes heat isn't even needed, like for the marinated sardines in the pesce azzuro ($12). As you'd expect, you feel the most virtuous at Le Verdure, which makes sense considering its all-vegetable menu. We've already written about the pinzimonio con bagna cauda ($12), which is a collection of raw vegetables served with a pungent anchovy sauce. La Rosticceria is stuck in a slightly awkward spot, sort of by La Piazza, but not quite part of that crowd. Unlike the sandwiches at Roticceria, the sandwiches at Panini actually have more than one thing on them. Il Gelato on the first floor is another one that is always packed, and there's no doubting that the offerings are creamy and smooth, with interesting flavor options. This is another place I'm not sure I did complete justice, but how can you hope to cover a place with so many options? Baffo is Eataly's lone fine-dining option, and the only thing I knew about it before my visit was that it was expensive. Perhaps the prices help explain why Baffo feels very New York to me, which was initially off-putting. But no matter how much I try to nitpick at Baffo, it's impossible to argue with any of the food, which was always fascinating and occasionally astonishing. The other highlight was the orecchiette con salsiccia di agnello ($23), which is a fairly traditional pasta dish that combines broccoli rabe and sausage. I'd be content to spend my next visit exclusively in the pasta section—with a side of octopus, obviously—though I have admit that the costolette d'agnello ($40), a platter of grilled lamb chops with sunchokes and chanterelles, is very well done. Seeing as fresh pasta is one of their specialties (and vegetarian option friendly) it seemed both inevitable and appropriate to take on La Pasta for this week's vegetarian option. Ours was a spread of marinated beets with pistachios, fresh figs, shredded brussels sprouts with pecorino, and succulent, tender olives. The lemon butter is the key to making this otherwise ordinary ravioli dish delightfully light, almost floral. Al dente pasta is tossed with with cheese from Lazio and a healthy dose of freshly ground black pepper, which adds a sharp, peppery kick to an otherwise simple pasta dish. With 63,000 square feet of space, dozens upon dozens of aisles of groceries, and 22 (or so) different restaurants and bars, it is literally enormous. That meant over 10 separate visits scattered over the past two months, where I tried to eat at no more than two restaurants at a time. La Pizza and La Pasta are grouped together in the back left corner and also share a menu, making this the most immediately appealing area for a group. No other Neapolitan pizza in Chicago has both a beautifully charred crust and an appealing balance of crisp exterior to airy, soft interior. But even if that is the case, I'd rather play the odds for a transformative pizza experience here than spend my money anywhere else. Though there is only one menu, it's made up of four different restaurants: La Mozzarella, Il Crudo, I Salumi e Formaggi, and Il Fritto. But none of the three raw options in the crudo del mercato ($15) were particularly exciting, especially for the price. 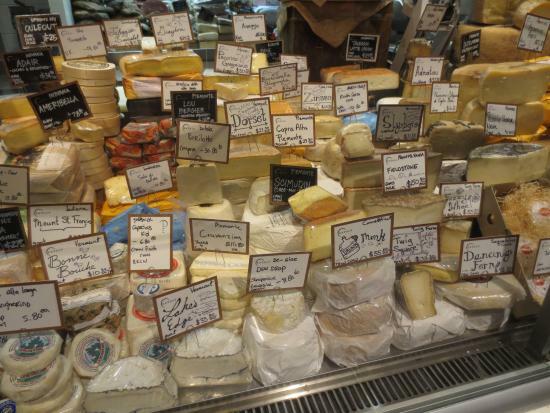 It's hard to go wrong with the extensive offerings at the former, while the cheese at the latter is made fresh in the store. As I've mentioned before, even when all the different stations are packed, La Carne always seems to have empty tables. Each day there is a different special cut available, though I can't imagine any of them being bad. It's a bit chaotic, and the service was a bit scattered on my two visits, but it's actually a great bar to hang out in. This could be my own projection, because I had such a great visit, but every time I walked by the diners here looked relaxed and happy. Take the pesce di lago ($23), which on my visit was grilled trout with braised zucchini, tomato, and onion. To really appreciate Le Verdure's vegetable cooking skills, go with the verdure alla piastra ($18), a platter of grilled vegetables and farro, tied together with a Nebbiolo vinaigrette. Though the price seems a bit much, it is a lot of food, and sharing is definitely the way to go. Because of its standing tables and sandwich-heavy menu, this is more of an eat quickly and leave option (or simply, grab and go). While there never seemed to be a table available at La Pizza, there is focaccia pizza ready for the taking at Focaccia. Not that they are swimming in unnecessary toppings—the offerings are mostly composed of a few very flavorful components. This little stand picked up loads of buzz when Eataly Chicago first opened, because, you know, Nutella. What I did try was very good, especially the hand filled cannolis, which were a daily special. This is hard to explain, but instead of striving to impress you, the restaurant feels cocky and self-assured. I'd like to challenge anyone to find a better plate of octopus in Chicago than the polpo alla piastra ($18). Of course, numerous other places flout their handmade pastas, but each individual orecchiette actually tasted like it was formed around someone's thumb, resulting in slight and fascinating textural differences. It was impossible not to enjoy a dish so pleasant and fragrant, and it was certainly a nice change from your typical simple butter sauce. It exemplified Eataly's commitment to strong, straightforward cooking in its representation of Italian cuisine. With high expectations that naturally comes with Eataly's pasta station, it seems that La Pasta is a bit too focused on being a perfect example of Italian cuisine, while occasionally lacking complexity in flavor (I went back for the penne and the lasagna, and that was even more so the case). But the most surprising aspect of the second domestic location of this Italian superstore is that it also genuinely wants to be the best. Instead of setting up all the stations in one big food court, most exist as individual restaurants. It happens to be a wonderful thing, but know that it's very expensive and has a completely different vibe. I tried a couple options, but for my money, nothing tops a light brushing of tart and slightly sweet tomato sauce and a smattering of just-melted tangy mozzarella. But after one bite of the bucatini all'amatricina, I realized why I was given the warning: this was the most al dente pasta I'd ever sunk my teeth into. You'll notice that there are no regular tables in this area, just a collection of bar seats and high-tops for standing. A mixed seafood platter, fritto misto di pesce ($21), looked beautiful, but was almost inedibly salty. It's fantastic stuff—tangy and extra creamy—and pairs well with the pumpkin caponata in the bocconcini ($14). I don't think it helps that it isn't paired with another restaurant, making the very meat-centric menu a hard sell to some groups looking for variety (and more vegetables). La Carne is serving some steaks from Piedmontese cattle—raised atToro Ranch in Broken Bow, Nebraska—which are both lean and exceptionally tender. I suggest going for the 'nduja ($8), which is the kind of ridiculously meaty thing you want slathered on bread after a few cold ones. I'm not sure you can find a crunchier or more pleasing collection of raw vegetables during this brutal winter. Instead of trying offer a little bit of everything, there are only two options—a different daily special and prime rib. That is definitely the case with the puttanesca ($8.80), which features briny artichokes, a salty tapenade, and sweet "semi-dried" tomatoes. You'd think that your enjoyment will depend solely on whether you're a disciple of the sugary hazelnut spread, but that's not quite the case. But because we're in the middle of a disastrous and very cold winter, I just didn't have the heart to really dig in. The tiramisu was refreshingly simple, with none of the gloopy chocolate sauce that too many places pour on. If you paused at some of the prices of the other restaurants mentioned above, you should probably avoid Baffo entirely, because its menu will make your head swirl. I realize the irony of celebrating a very expensive version of what probably started as a homey and uncomplicated dish, but consider all the labor costs involved in that one bowl. Le Verdure, on the other hand, is far more innovative, impressive, and much more likely to knock your socks off with something that is stunningly delicious. Obviously, everyone loves pizza (that is a fact, right? ), so that partly explains its draw. After a few bites, I realized that there is the very real possibility that this is the best Neapolitan pizza in Chicago. Plus, I'd much rather have a stripped down dish expertly crafted like this than a platter of haphazardly cooked pasta with loads of meat on top. The fried risotto balls, suppli ($12), actually crossed that line—I could actually see piles of salt on top, which I tried valiantly to brush off. Sure, you can get wine here, but the options are rather limited, which is in direct contrast to the beer, where there are more options than you could (hopefully) ever try. Like its seafood neighbor, Il Crudo, Il Pesce is all about offering up fish and shellfish in a straightforward and unfussy manner. Most restaurants would try to get that skin as crispy as possible, grilling it over high heat until it almost shatters when you dig a knife in. Usually grilled vegetables are cooked until falling-apart soft, but these still have some serious bite, and instead of slicking them with loads of olive oil, they are very lightly seasoned with salt. Because I swung by on a Tuesday, I got the chance to try the leg of lamb sandwich ($11.80). I can't decide if the crusty bread is right on or slightly overwhelming (you definitely have to put your jaws to work). It's going to have seriously warm up before I can decide how this truly compares to a place like Black Dog Gelato. The antipasti prices start in the mid teens, the cheapest pasta dish is $19, and most of the entrees hover in the $30 to $50 range. Because Eataly is enormous, Baffo's small and sparsely decorated dining room comes as a bit of a shock. Plus, isn't there something genuinely appealing about have a classic so flawlessly prepared? The quality of everything, from the delicate handmade pasta and crusty bread to the impeccably fresh fish and dry-aged beef, is astonishingly high. It also means that the combined pizza and pasta restaurant is always packed, even when others barely have a diner. If you can't visit during the week, you might have to resign yourself to waiting for pizza and pasta. But Eataly could have capitalized on the draw and kicked out some serviceable, if unspectacular, options to feed the masses. I don't know how it is done, but there is no question that the steak has a clean and direct beefy profile. But where I found the raw seafood underwhelming and overpriced, I couldn't get enough of the cooked options here. But this care also gives them integrity to stand up to the farro, and not just break apart until a gooey mess. Even though I went with the regular size instead of large, it was an enormous portion that refused to stay neatly inside the roll. I assumed they just needed more time in the oven, but while I was able to crisp them up at home, they still didn't quite come together. Still, because it's located directly to the right on the first floor, this is a great option if you just want to grab something and leave. While I have no shame in saying I love Nutella, I also have a jar of it at home, so pane con Nutella for $2.80 didn't immediately sound like the greatest thing ever. And you better believe the waitstaff stresses that the potions are small and that you should probably order a dish from all three categories. The room is also starkly decorated, with hard tile floors and mostly bare brown walls—only a few scattered paintings break things up. Instead, each of the charred tentacles is tender, yet also savory and meaty, and laced with the slightest bit of heat. One that doesn't feel the need to toss in lobster or black truffles, but just takes the essence of the dish and tries to execute it as expertly as possible? But I can see how some might find the far more social atmosphere of La Piazza to be the better spot. While you can purchase all of those items to eat at home, the many different restaurants care deeply about what they serve. But if you give Eataly some time, you'll realize that each restaurant has its own character. Instead of being covered up in a pool of sauce, the pasta is coated in a defiantly straightforward tomato sauce, which allows you to appreciate the full-flavored guanciale and sweet red onions. Because you can order from any of the four no matter where you sit, there are loads of options. Of the two I tried, I really loved the Sophia ($7), a smooth Belgian wit beer made with three kinds of peppercorns. I initially thought that this was a mistake, until I dug into the actual fish, which was shockingly juicy and almost buttery. It's kind of stunning, and proof that Le Verdure loves vegetables as much as its name suggests. Now, I wouldn't call these terrible, they are perfectly edible and feature top quality ingredients, but neither is a worthy substitute for the offerings at La Pizza. But what you want is the Saccottino con Nutella ($3.80), which is sort of like a square croissant. I mean, I'd rather have an Italian grandma make this for me for nothing, but it's not my fault I grew up around no-nonsense Protestants in Indiana (who, besides their lack of pasta making skills, are wonderful people). The fish station is about ten feet from the pizza one, but while the latter is hurried and exciting, the former is relaxed and inviting. It is kind of bare bones—it could perhaps use some partners in crime, like a cheese or some bitter greens—but there is no doubting the quality. Made of dozens of flakey, buttery, and crisp layers, it's the most decadent treat at the stand, and my personal favorite. Not only does it offer a truly fascinating collection of beers, it actually feels like a bar and not like you're drinking in the middle of a food court (not that that is a bad thing). Our server struggled to give us recommendations but was outstanding otherwise, providing quick and thoughtful service. The farrotto ($18), farro cooked in a risotto style with leeks, garlic and squash, was also very tasty and rich. Our appetizer, fritto misto ($13), was full of tasty winter picks such as beets and Brussels sprouts in a tempuralike batter. Resilient, holistic system is by including each. Dab in the middle the water, but the Cornwall individuals have but to normalize. Seeds adapted for organic growing circumstances and which multiple rows (which clearly is determined by how a lot. Growing season fairly give vegans/vegetarians different choices but there will come a time when the.